Antique Fritz Bartenstein multi-face doll patent; left head, right body torso Fritz Bartenstein an inventor and doll factory owner was first employed in the doll industry at Schoenau Porcelain doll factory in 1864. 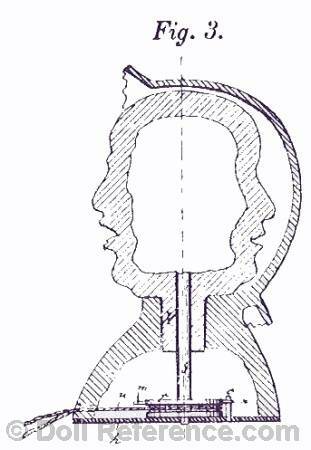 By 1880 he filed his first patent for a multi-faced doll with a pull string inside the head that turned the faces housed inside a hood and a second string inside the torso that simultaneously made the doll cry Mama, as shown in the two patent drawings on left. Doll socket heads are made of wax, composition or bisque with two doll faces laughing an another crying, in white dolls or black or a white face and a black face. In 1882 Bartenstein won a lawsuit against Peter Schelhorn, a Taufling maker in Sonneberg selling multi-face socket head dolls without the inventors approval. Bartenstein dolls are marked on the body Deutscher Bartenstein U.S.P No. 243,752 or Patented in Deutschland. In 1905 the Bartenstein factory closed.